In the past few days, we’ve seen swimming pigs, and swam inside Thunderball Grotto. At O’Brien’s Cay we visited a snorkelling site called “The Aquarium”. And, at Warderick Wells we hiked to see the remains of some Loyalist houses from the 1750s. As much as possible we try to tie-in some homeschooling to our sightseeing. We feel a huge responsibility to make sure our kids have a solid education. For example, at “The Aquarium” we taught our kids about careful, scientific observation. Our kids used a snorkel and a bathyscope to view reef fish. We encouraged them to observe specific characteristics of the fish, such as colour(s) or the shape of the dorsal fin. Then we helped them to identify what they saw using a guidebook. Karen (4), Betty (10), and Paul using our reef fish identification book. At Pig Beach we learned that pigs bite. As our kids approached a fully grown pig, a woman warned us that another tourist has just been bitten. That put me off the pigs. 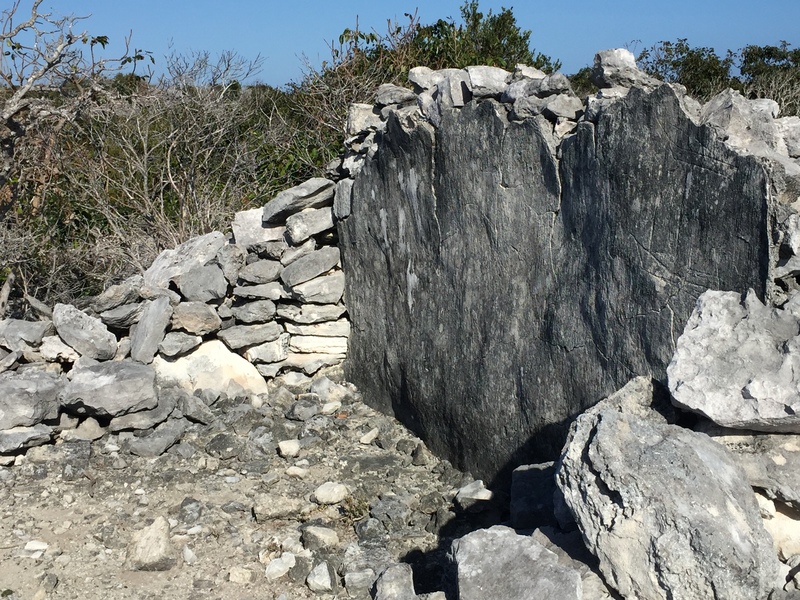 Fortunately, there is much to see in the Exumas island chain. It’s a little bit like visiting the Canadian Rockies. But, of course, it’s purely Bahamian. The islands are jaw-dropping. Yet, there are hints of civilization. Staniel Cay, for example has three convenience stores. The Pink Pearl Convenience Store was closed today. Word has it that the owner was in Nassau. At the Staniel Cay Yacht Club people on the docks mix and mingle as they watch nurse sharks feed from scraps thrown by fishermen, or our son, Paul. Today, there must have been 30 sharks waiting to be fed. Nurse sharks don’t bite but they have a powerful suction if provoked. I will admit that in some cases, our adventures push our kids outside their comfort zone – though they gladly will stand mere feet away from 30 hungry sharks. Henry and Paul, for example, were reluctant at first to enter Thunderball Grotto. Truth be told, I found the current around the cave to be intimidating. Henry was afraid of seeing a shark in the cave. Paul was afraid that the tide might close the entrance before he could leave. But, we wore our life jackets. And, with some convincing, both boys cast their fears aside, and didn’t want to leave the cave. People from a super yacht jumped from a hole at the top of the cave to the watery depths below. The kids thought this was fantastic. There were no sharks. But, lots of reef fish. And, we left the cave before the tide came in. I’ll leave this blog post with a picture from our Warderick Wells hike. The hike took us through tropical forests. And, we hiked past deep cisterns that made my heart skip a beat. Davis ruins circa 1750 seen on our hike at Warderick Wells. My next post will be from Georgetown, Bahamas, where we will have reliable Internet access again. We hope to meet some other kid boats. my family and I are going to be at the roatan island (west bay beach) between the 28th and 4th. I don’t suppose you could sail over eh? To my family of friends, love watching the kids feed the nurse sharks everyone seems to be well adapted to their sea legs. I been here in Miami a few days and feel like growing fins to swim down and join you guys. The more I see , the more I want to sea!!!!! Think if I got on board you would have to toss me over to get rid of me! Here if you need a backup, Rick. Keeeeeeeep going. Come and visit Carl!!! Anytime. We’re in Grorgetown right now, leaving Friday but will be back in Georgetown on March 30/31 as my sister flies out on the 31st. Very tempting Lorraine, Happy Easter to all of the family!